Home / Our Staff / Nancy Duncan Stranz, M.D. Dr. Stranz joined Women’s Health and Menopause Center’s practice in September 2017 bringing her strong commitment to patient advocacy. Dr. Stranz grew up in Beverly Hills, Michigan and attended Groves High School (class of 1999). Dr. Stranz continued her studies at the University of Michigan majoring in Chemistry and Biochemistry graduating in 2003. She then attended Michigan State University College of Human Medicine for medical school graduating in 2007 and where she first met Dr. Amy Marcotte. 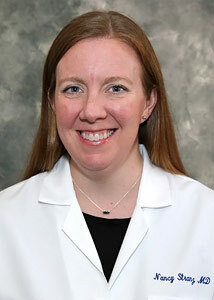 Dr. Stranz completed her residency at the University of Chicago, where she was elected Chief Resident from 2010-2011 and received the Resident Teaching Award several times. From there, Dr. Stranz opened a private practice in Oak Lawn, Illinois for 6 years and received the Physician Excellence Award in Patient Communication from Advocate Christ Medical Center on multiple occasions. Dr. Stranz is very happy to return to her hometown and be back in Southeast Michigan with her husband, son and daughter.